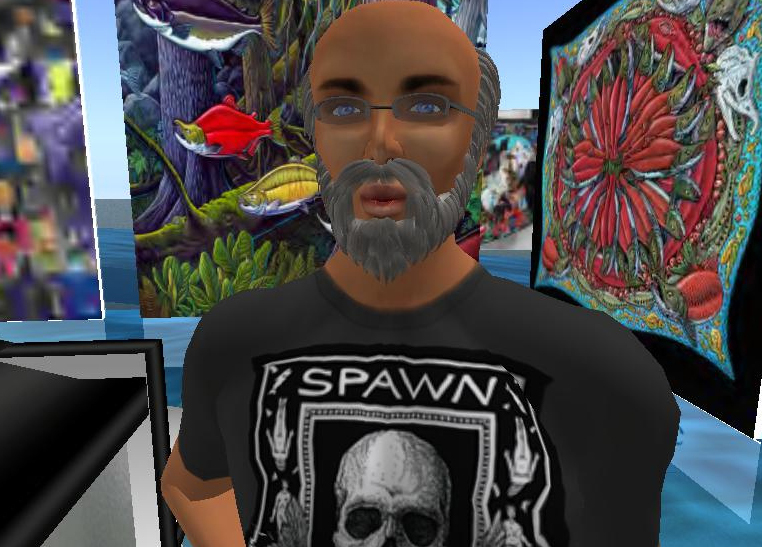 When I was given the Rasmuson 2011 Distinguished Artist Award they also announced it in the online world of Second Life. Here’s my stylin’ avatar hanging out in the Ray Troll Gallery section. May 18, 2011 – He may be best known for his fishy images on T-shirts, and popular books and publications on aquatic life, but Ketchikan Artist Ray Troll joined an elite group of Alaska artists today by receiving the 2011 Rasmuson Foundation Distinguished Artist Award. Troll is the eighth Alaskan artist to receive the award, which was announced at a morning ceremony in Anchorage. The Distinguished Artist Award recognizes artists with stature, and a history of creative excellence and accomplishments in the arts with $25,000 in unrestricted funds. Troll moved to Alaska in 1983 and he operates the Soho Coho Gallery in Ketchikan. His wildly imaginative work combines serious scientific study, a unique artistic esthetic, and a love of cheeseburgers for a style that is unmistakably his own. He is an Alaskan ambassador to the world. He has mounted four nationally touring exhibits, published six books, and has received dozens of commissions including those from the Smithsonian, Greenpeace, and Tokyo’s Museum of Science and Nature. Most recently, he and science writer Kirk Johnson were awarded a $50,000 joint fellowship from the John Simon Guggenheim Memorial Foundation to support a book project Cruisin the Eternal Coastline: The Best of the Fossil West from Baja to Barrow. Troll has served as art director for the Miami Museum of Science, appeared on the Discovery Channel, lectured at Cornell, Harvard and Yale and has shown work at the Smithsonian. He is a 2006 recipient of the Alaska Governor’s Award for the Arts and won a gold medal for distinction in the natural history arts from the Academy of Natural Sciences in 2007. In December 2003, the Rasmuson Foundation Board of Directors launched a multi-year initiative to make a significant investment into the arts and cultural resources of the state. Designed with the help from artists and arts organizations from around the state, the initiative prioritized support to practicing artists themselves as a key strategy to ensure Alaska enjoys a vibrant art and culture community. This is the eighth year of the Individual Artist Awards program, and as of today, the program has awarded 230 grants, totaling $1.7 million dollars, directly to Alaska artists. The purpose of the awards is to allow artists to seek a variety of creative opportunities, including providing them with the time necessary to focus on creative work. The Rasmuson Foundation was created in May 1955 by Jenny Rasmuson to honor her late husband, “E.A.” Rasmuson. The Foundation is a catalyst to promote a better life for all Alaskans.